#MTtalk Team Building: Good, Bad and Ugly! Politics and team-building events have one thing in common: they have the power to unite or divide people. Team-building events that are badly planned or poorly executed can do more harm than good. They can cause division and conflict if participants are forced to do things they are uncomfortable doing, or that they simply can’t do. On the other hand, activities that are planned with sensitivity, creativity and the specific needs of a team in mind, can be very successful. People may get to know their colleagues on a different level, understand one another better and increase their ability to work as a team. 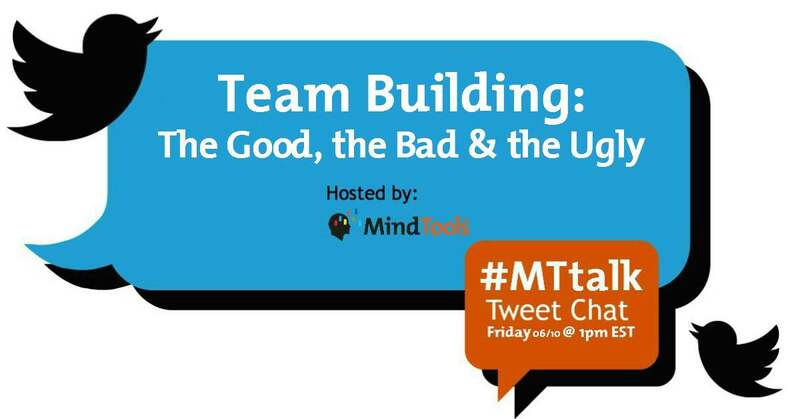 The topic for our latest #MTtalk Twitter chat, held on Friday, June 10 was, “Team Building: The Good, the Bad and the Ugly.” Here are the questions and some of the responses from the chat. Question 1: What do you see as “team building”? @Adrianruiz1: There is a difference between a group of people working together and a team of people accomplishing goals together. Teams are rare. @Singh_Vandana: It refers to various activities undertaken to motivate team members & increase the overall performance of the team. @ZalkaB: It’s how a team lives and breathes together. Not just doing some team building, but using the idea to build and connect with people. Question 2: What kind of team challenges or issues can you try to address during team-building activities? @Dwyka_Consult: Team building can help teams bond/become stronger, overcome diversity issues, communicate without masks. @Singh_Vandana: Adaptability, problem-solving, decision-making, trust and communication. Question 3: What is the level of support for team-building activities within your organization? @ZalkaB: From past experience – it was rather a “to-do” than a real, gradual, continuous practice. So I would like to change this mindset. @MicheleDD_MT: Depends on the leader & culture. If the leader finds value in them, there is support. Some see them as a drain on productivity. Question 4: What is the best team-building activity you participated in? What made it great? Question 5: What is the worst team-building activity you participated in? What made it so awful? Question 6: What common pitfalls should you try to avoid when planning a team-building activity or event? @Midgie_MT: Best to avoid lots of strenuous physical activities. @NootsCaboots: Try not to make it too much of a competition. Making team building activities too competitive can tend to divide group. Question 7: How can you ensure that the learnings from the team-building activity are sustained? @PowerDigMarketing: Send surveys to the team post-event & get candid (anonymous) feedback & take-aways & action items. @Midgie_MT: To sustain the learnings, continue to hold regular team debriefs to go over the take-aways. Question 8: How do you encourage the naysayers on the team to participate in team-building? @Yolande_MT: Involve them in planning and arrangements. @danceswithlyons: Encourage empathy and recognise diversity – create environment where learning can be found in everything! Question 9: How can you make sure that everybody is equally involved, regardless of personality and abilities? @GThakore: Best way is to set targets for everyone and their accountability for its success or failure. @NootsCaboots: Pick groups with a mix of abilities and make sure everyone has an assigned role. Question 10: What advice do you have for someone putting together a team building event? @WonderPix: Have objectives first, then choose activities that will help support those. @danceswithlyons: Get a facilitator, be clear on goals/outcome, level the playing field & honor difference; have empathy & get input from team. We’ll be discussing this situation in our next #MTtalk chat, “From Expert to Manager,” on Friday, June 24, 2016. As always, it will take place at 1 p.m. EST (5 p.m. GMT). We’d love you to join us on Twitter to share your thoughts and ideas with us. To join the chat, type #MTtalk in the Twitter search function. Then, click on “All Tweets” and you’ll be able to follow the live chat feed. To participate, simply include #MTtalk in your tweet and it will show up in the chat feed. Hi Emile, Thanks for sharing that story. I do sometimes wonder what people were thinking, or not, for some of the team building activities such as the swimming pool one! Not surprising the effect was poor! !